VT Rifle 2014: Hunts 1 & 2 - Success!! - the4pointer.com | Real Hunts. Unreal Stories. 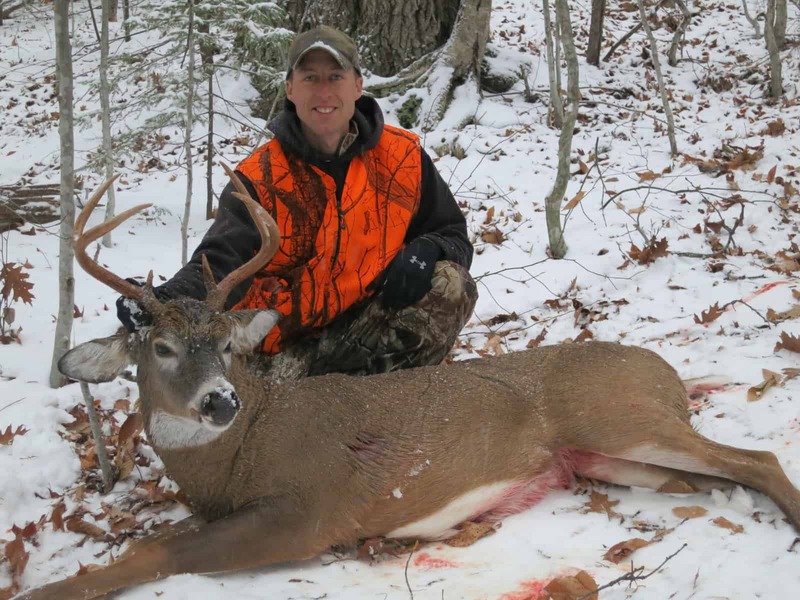 VT Rifle 2014: Hunts 1 & 2 – Success!! Around 10 am on opening day I met up with Dad who was sitting in his typical spot in a big open hardwoods. “Not much happening,” I said bleakly to him. 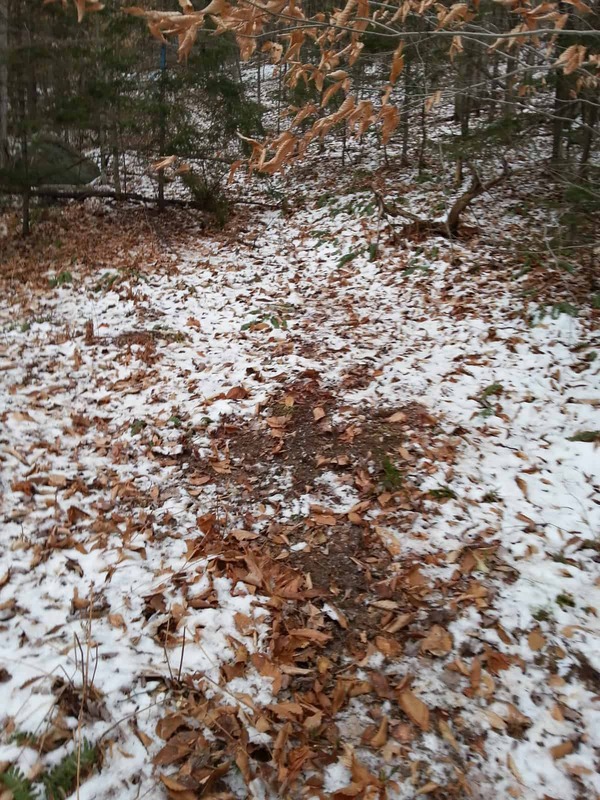 As is my opening day custom, I had just covered a lot of ground in hopes of getting a feel for where the deer were spending their time but hadn’t seen a single track in the fresh snow. The afternoon before Dad and I had checked a trail camera that had a number of decent bucks on it, including a couple new bucks, but the excitement over those pictures had since faded after my uneventful morning. “I’m going to go check out a new spot and see if I can’t hunt my way up the hill and push something to Josh,” I told him. Josh was positioned near the trail camera that had the bucks on it and it showed that they were moving up and down the hill in the early morning hours and just after dark. In fact, one picture even showed a nice 8 point using the trail 20 minutes after daylight which was the first deer we had on camera in legal light all year! It was also close to the location where I’d put my archery tag around a small deer earlier in the year so we knew the deer were in the area. I hiked all the way to the bottom of the ridge and then slowly started working my way back up the dense hillside towards Josh. The area was thick with beech saplings and the leaves were still clinging to most of their branches making it difficult to see more than 30 yards. I doubted I’d be able to get a shot at any deer if I jumped one. I soon found an ancient logging trail that was cut into the hillside and began to follow it towards Josh. To my surprise I found some fresh tracks that led me to the freshest scrape I’d seen in many years. That got me excited! Usually, the Vermont Rifle season falls too late in the year for bucks to be making fresh scrapes. I typically find old scrape lines that had been made sometime after archery season at the end of October and the beginning of rifle season in the middle of November so when I found this scrape I was excited to say the least. I followed the tracks further up the old road and found another scrape, then another, and another, and finally one more! All of them had been made after the dusting of snow we had the night before. The only disappointing thing about the scrape line was that it was tucked in the stand of dense beech saplings, and try as I did, I couldn’t find a worthwhile spot to set up to ambush him on his return visit. 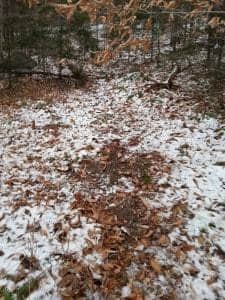 But about 50 yards beyond the last scrape I entered into a mature stand of hemlock trees that was bordered by a steep ravine on one side and a slightly more open hardwoods on the other. “This is the best spot,” I told myself. Just then I saw Josh waving his arms at the edge of the ravine and I made my way over to him. He had found a perfect log to sit against and I let him know about the fresh scrape line just below him. He had found the best available spot to set up on the scrape line and we knew if we sat there long enough someone would see something – hopefully a buck. I didn’t get a chance to hunt on Sunday but I thought about the scrape line often throughout the day. I even thought about it during church (GASP!). I also thought about it on the way home from church, at the birthday party I went to in the afternoon, and when I went to bed that night. There were a few times I thought about it in between as well. On Sunday afternoon we had an unexpected change in work plans for Monday due to the impending messy weather which allowed me the opportunity to sneak out for a few hours in the morning and I couldn’t wait for daybreak. Josh was hoping to come but couldn’t end up making it so I made a bee line for the log he found at the end of the scrape line. It was a half a mile hike and I settled about 10 minutes before daybreak. The snow was coming down hard and had already accumulated over an inch since beginning a short while earlier. Around 6:30 I pulled out my grunt tube and gave a few aggressive grunts in the direction of the scrape line. I have had success with a grunt tube near fresh buck sign in the past so I had hopes that it would work again. Not more than five minutes passed when I suddenly caught movement to my right. It was close and I could tell it was a big deer. I raised my gun and put my scope on his head. 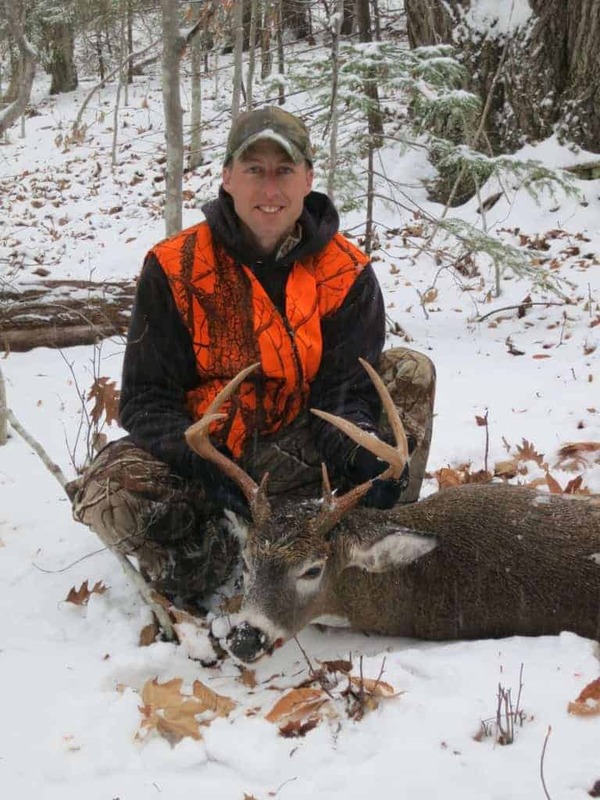 He was ghost like as he moved through the dark hemlocks but his rack and body were silhouetted against the fresh snow in the hardwoods behind him. I wish I could have taken a picture of that moment because it symbolized everything I’ve thought of the bucks here. They are like ghosts – rarely showing themselves in the daylight. I bleated with my mouth to stop him and he paused behind a big hemlock. I leaned far enough to the side to expose his vitals and pulled the trigger. He hunched up and ran straight away from me and then veered back down the hill and out of sight. It was too brushy for a follow up shot; otherwise I would have shot again before losing sight of him. The entire encounter probably only took five seconds from the time I saw him to the time I shot! After a few seconds of trying to locate where he was standing when I shot I finally found his tracks but the snow was falling hard enough that it had already made it difficult to find blood. Just then I saw him fall over about 70 yards away. I ran to him and was ecstatic to see that he was the big six point that had just showed up on camera! He weighed in at 175 lbs clean dressed. This buck ranks at the top of my personal favorites because I had formulated a game plan based on fresh sign and then was able put myself in the right place at the right time. For me, there is no more rewarding feeling than outsmarting a wary buck by beating him at his own game. Fortunately, this time I happened to be in position when he was there and thankfully he was a little late getting to bed!